Being a physicist requires patience and a certain kind of faith, especially when you are investigating the fundamental nature of the universe. This is the research world I live in: We devise sophisticated experiments that often need extensive coaxing or reconfiguring before they work as intended. We’re looking in some new way for a result which either fits the current theory under previously unexplored conditions, or else deviates from it in a small but significant way. Usually we just get the results we expected, and only our colleagues who do similar research find that interesting. If we do measure a deviation or record an unexpected signal, we have to figure out whether it’s due to some equipment problem or an overlooked systematic error before we can claim to have found something meaningful. That is often the hardest part of the research. Only rarely does a physics experiment reveal something really new, and then it tends to be something subtle and important but hard to explain to non-scientists. But you probably have heard about my discovery. I discovered gravitational waves. Well, I and about 1000 collaborators…my project, LIGO, is one of those Big Science experiments that requires a truly monumental effort. In our case we need to measure distances between pairs of mirrors with unfathomable precision: better than 1 part in a million million billion. Our detectors are huge—4 kilometers from mirror to mirror—and yet we’re looking for distance variations a thousand times smaller than the nucleus of an atom. The laser interferometers that do that are marvels of design and engineering, pushing the limits of precision measurement techniques until we are running up against the basic quantum fuzziness of matter and light. The detectors and the data analysis techniques that can pick out a signal hiding in the noise should work, in theory, but my Ph.D. advisor warned me when I got my degree and was heading off to Caltech to join the LIGO team as a postdoc: “You may be moving from a difficult experiment to an impossible one.” That was over 16 years ago, and some of my colleagues had already been working for many years to design and build LIGO. We collect data, analyze it, detect nothing, improve the detectors a bit more, repeat the cycle. Detecting nothing does not mean failure; we use each null result to calculate limits on gravitational waves from various sources which are rigorous and scientifically meaningful, but hardly exciting. How does one work on a project for so long without finding a definitive signal? We have always had faith that the gravitational waves are out there to be detected. Albert Einstein predicted their existence as a mathematical consequence of his general theory of relativity. He thought they could never be detected, but indirect evidence and the application of his theory to neutron stars and black holes—astrophysical objects that were unknown in Einstein’s time—hinted that gravitational waves should be detectable after all. Joseph Weber, a physics professor at UMCP, took up the challenge in the late 1950’s and started building detectors that he claimed could do the job. Talk about a fearless idea! He never succeeded in recording a confirmed signal, but he inspired others and launched the field. I’m sorry that I never had the privilege of meeting Joe Weber; he passed away in 2000, several years before I came to Maryland as a faculty member to help carry on the work begun by him and continued by other UMCP physicists along with scientists around the world. Progress in detector technologies and sophistication, deployed over the past five years in what we call the Advanced LIGO upgrade, strengthened our faith that we were finally closing in on those elusive gravitational waves. But they’re not predictable events; they sweep by Earth at random times, and we had only a vague idea of how frequent and strong they would be, so we didn’t know when we would actually capture one. All we could do was to work hard to make our detectors as sensitive as possible, collect data, and wait. Patience is essential in this kind of research. But we didn’t have to wait long once we had the new detectors up and running. We hit the jackpot on the morning of September 14, during the warm-up period before Advanced LIGO observing officially began! 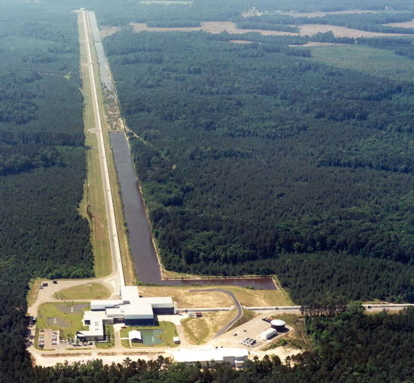 A clear, strong signal appeared in the LIGO detectors in Louisiana and Washington state 7 milliseconds apart, consistent with a wave traveling at the speed of light. The duration and form of the signal matched what we would expect from a pair of merging black holes, each about 30 times as massive as the Sun. My first reaction was disbelief; in fact, most of us looking at the plots on our laptop screens assumed that it was some sort of pre-run test signal. But triple-checking proved, by later in the day, that it was not a test. The whole collaboration spent the next few months in a state of frenzy, systematically checking for possible instrumental artifacts, analyzing and re-analyzing the data, and considering what the signal could tell us about physics and astronomy. We wrote over a dozen papers covering various aspects of the experiment, the analysis and the implications—while keeping it all under wraps until we were fully ready to announce our findings, on February 11. The arrival of a second strong event candidate (on Christmas Day!) provided a welcome psychological boost during that period of tense secrecy. I still marvel at the suddenness of that first discovery, even though it took months of hard work to fully digest it. In our jargon it was a “golden event”, stronger and clearer than we had a right to expect based on the laws of statistics. That single event proved beyond doubt that gravitational waves are real and detectable, and revealed a new population of black holes heavier than any we had known about before in binary star systems. That tells us something about how massive stars are born and die, collapsing to form black holes, although we still aren’t sure whether they live their whole lives locked in a binary or pair up later. We’ve also studied the signal in great detail to test whether general relativity is the correct theory of gravity. Einstein seems to be right so far. I can’t avoid the cliché: this is only the beginning. We will keep improving our detectors, collecting data and cataloging more merging black holes. We also hope to detect other types of gravitational-wave signals, and will hold onto our well-practiced patience for those. Were we lucky? Or simply well-prepared? A little of each, I think. Some research is deliberate, progressing toward a conclusion on a (more-or-less) known timetable, even if the result may be unknown until the end. Other research requires waiting for events which occur at random times from an unknown population, which in physics and astronomy could be black hole binary mergers, supernovas, or rare particle decays. Discoveries are possible in either case. With LIGO, we had the privilege of having Einstein on our side, telling us what individual events should look like but leaving us in the dark about when and how often they would arrive. It was a joyful day when we finally captured the first one.